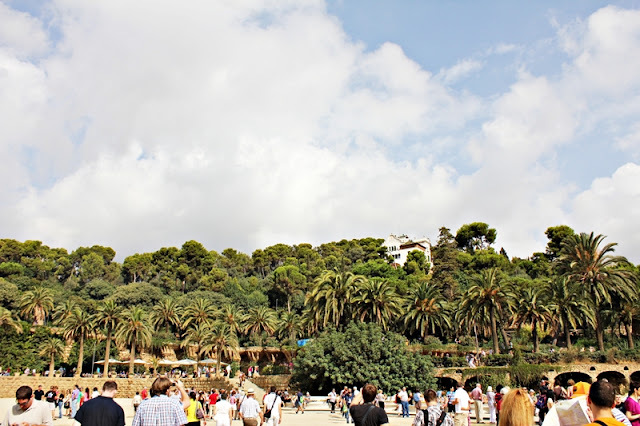 these are photos from the amazing Park Güell. It was designed by the Catalan architect Antoni Gaudí and built in the years 1900 to 1914. 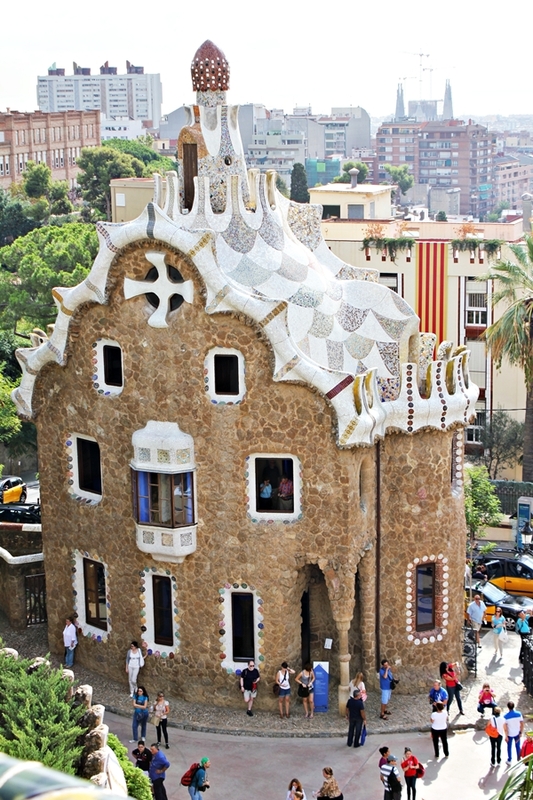 It is part of the UNESCO World Heritage Site "Works of Antoni Gaudí". You can find his representative mosaic everywhere! 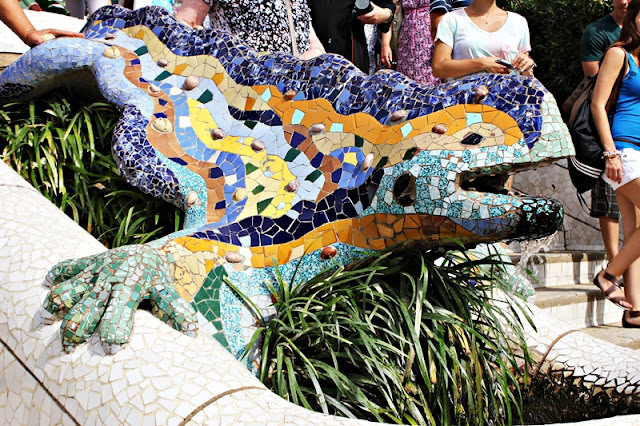 I loved Gaudí's multicolored mosaic salamander, popularly known as "el drac". You can see him on photos below. 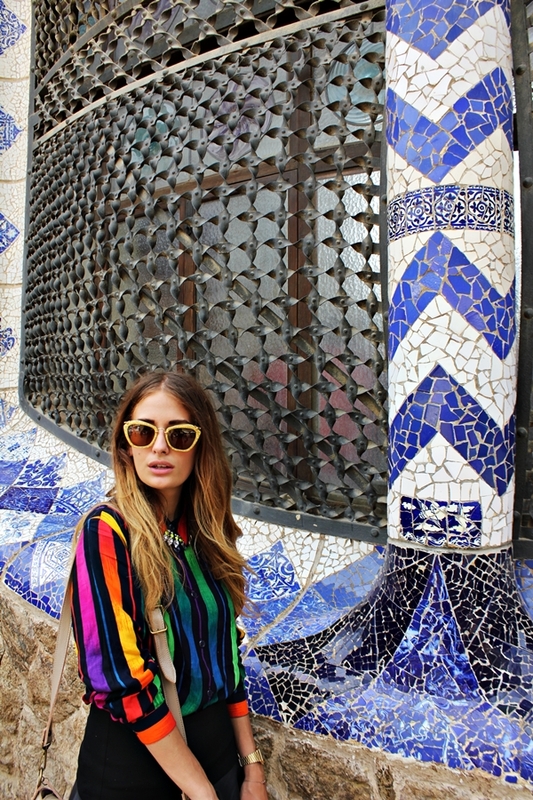 I love this multicolor stripe shirt I got from this boutique called Ciuchbuda, that I accidently found on facebook. They have amazing vtg clothes. Your shirt and shoes are amazing, I want to steal them! I'm visiting barcelona for the second time in June 2013, I'm excited! SO glade that you are enjoying Barcelona ! Beautiful pictures ! Awesome photos!!! Thanks for sharing. Barcelona is such a fanastic city!!! Your shirt is totally cool!!! Super ti je kombinacija i slike su sjajne! :) Love it! Your shirt is really nice, very colorful! 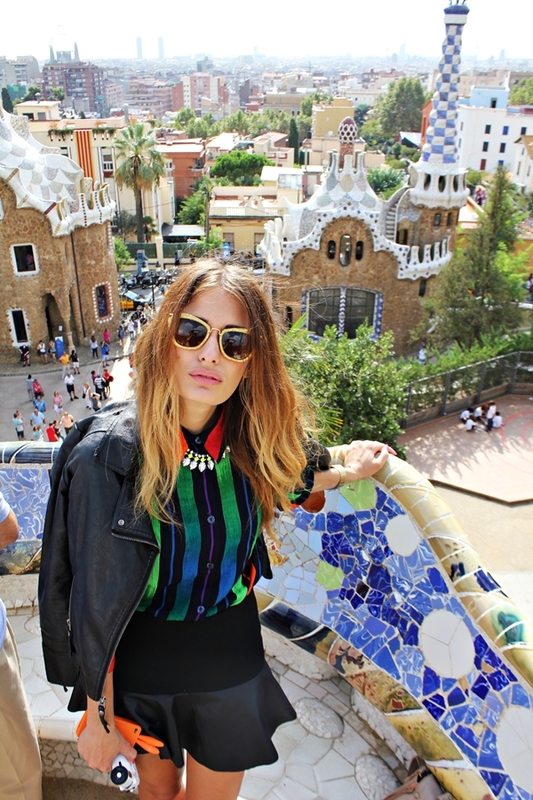 I'm like you like Barcelona, it's my city :) Your blouse is gorgeous! I have been to this park and it is beautiful. Love all of the works of Gaudi. Enjoy your trip. Lovely pictures, I had an amazing time last time I visited Park Guell! 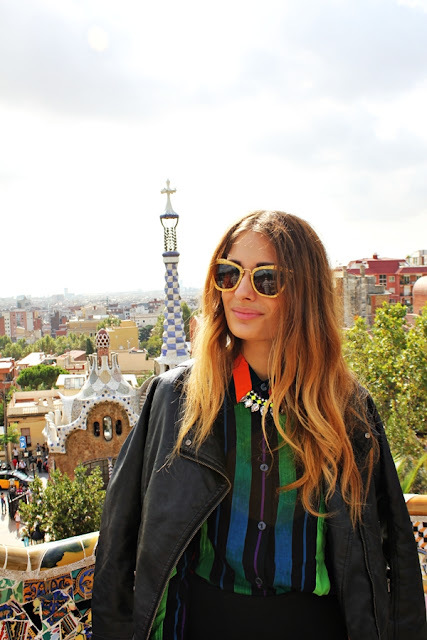 Ooohhhh me encanta este parque es genial y tu look perfecto para el momento. 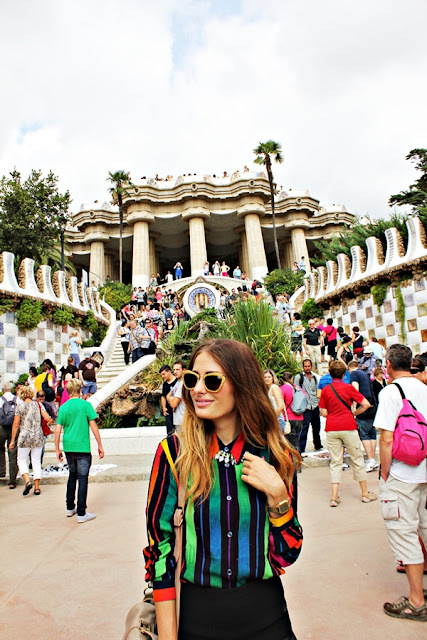 Park Güell is amazing! We love it :) Nice outfit, you are gorgeous! beautiful outfit :):):)! !Your blog is so lovely! I'm thinking, if you want, we can follow each other! It would be great!! I really like the pics! And perfect outfit! Un look genial, me encantan tus botines! Barcelona is so beautiful! I like your shirt, very cute. Amazing photos, really loving these traveling photos. & love your shirt, such a nice pop of color. the shirt, necklace- everything perfect! wow amazing photos! You look so pretty. xO! I have read about this place in so many blogs. Looks so amazing. Lovely outfit. Do you like to follow each other on GFC and bloglovin? Let me know will love to follow back. I love Barcelona! And your blog! Thanks for following, I follow you back now! Love Barcelona so much ! What a amazing look and stunning pictures...your post are always so cool! Wow! You are absolutely striking! Loving this look, especially in that setting. Aww so pretty! I've always wanted to visit Barcelona. I think it could be the most beautiful but at the same time the weirdest place on earth. That architecture makes me crazy, it's like a candyshop for a child! Amazing pictures ! Love that blouse too ! Thanks for the sweet comment on my blog. Of course I want to follow each other, I now do via GFC, hope you will too ! Amazing look!! Love the top!! I'm in love with your shirt!! Amazing pictures, I would love to get the chance to visit Barcelona!! Thanks for taking us along your travels!! as a person you are just flawless + your style is so good, amazing! thanks love for leaving a comment. I am so sad I did not get that zara skirt last week. It looks amazing on you. Witam i dziękuję, że mnie odwiedziłaś, jest mi miło. Faktycznie mamy coś wspólnego,piękną Barcelonę. Ślicznie wyglądałaś na tle wielu ciekawych miejsc. Pozdrawiam. Hello and thank you for you visited me, I'm nice. In fact, we have something in common, the beautiful city of Barcelona. Looked lovely against the many interesting places. Yours.